Disclosure of Material Connection: Some of the links in this post are “affiliate links.” This means if you click on the link and purchase the item, I will receive an affiliate commission. Regardless, I only recommend products or services I use personally and believe will add value to my readers. I am disclosing this in accordance with the Federal Trade Commission’s 16 CFR, Part 255: “Guides Concerning the Use of Endorsements and Testimonials in Advertising.”One of the new-to-me desserts I discovered after spending time on Pinterest was the trifle. A trifle is a layered English dessert often containing custard, fruit, gelatin and sponge cake. It is 2015 and we do trifles a bit differently nowadays. One thing you need to make a trifle is a nice bowl. I had this Trifle Bowl on my Amazon wish list and I was blessed to receive it from my parents last Christmas. When my mother-in-law planned a family going away dinner for Jordan, I knew this was a great opportunity to make my first trifle. I gave Jordan some flavor combination choices based on some I had pinned and he chose chocolate/peanut butter. I read several recipes to get a good idea of how to create this flavor packed delight. I ended up going a bit rogue and concocting my own recipe. 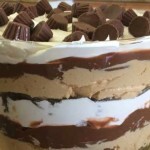 This delicious layered dessert was the hit of our party and will be the hit of yours too! Make the brownies according to the instructions on the box. Make the pudding according to the instructions on the box. Cover and place in refrigerator to set-up. In a large mixing bowl beat together 1 container of Cool Whip, Cream Cheese, Confectioner's Sugar, Peanut Butter and 2 TBS milk. Layer 1/2 the brownie chunks on the bottom of the bowl. Cover the brownies with 1/2 of the peanut butter mixture. Next, add a layer of 1/2 of the chocolate pudding. Carefully cover the pudding in a layer of 1/2 the container of Cool Whip. Sprinkle 1/2 of the mini Reece's Cups on top of the Cool Whip. Since we were going to be eating this at the end of a very busy day, I pre-made most of the ingredients the night before. I cooked the brownies, made the pudding and the peanut butter layers in advance. I just kept the pudding and peanut butter in the refrigerator. I took the peanut butter mixture out of the fridge about 15 minutes before assembling so it could warm up a bit. I added about 2 TBS of additional milk and whipped it for a minute or two before layering it. 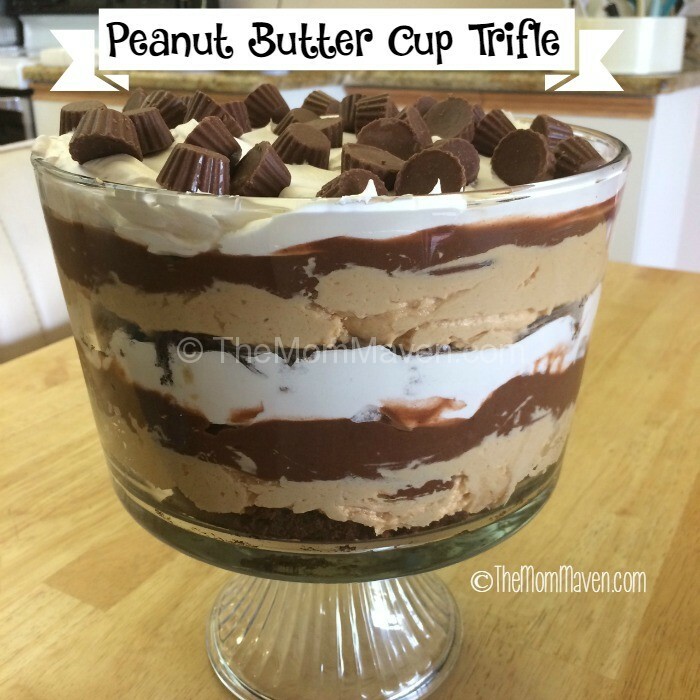 This Peanut Butter Cup Trifle was easy to whip up and a huge hit at the party. My nephew asked if I would make him one instead of a birthday cake this year! The trifle easily fed the 13 of us at the party with a little left over. Make sure you have a long spoon for serving! I hope you enjoy this recipe and all of the easy recipes I share here on The Mom Maven. I hope you share them on your social networks. I just ask that you not copy and share the entire recipe with photos. Please use the sharing buttons below and share the link to this post. Thanks! This looks great! Would be a perfect dessert for Easter lunch this year. I LOVE trifles! This one looks so good and so rich. Poor me a cup of milk! Girl, you are trying to kill me. this looks amazing. I can almost taste it. Oh my god that looks like a heartattack. A delicious, decadent heart attack that’s well worth it. Heart Attack in a bowl, but looks delicious. I love the peanut butter cups.